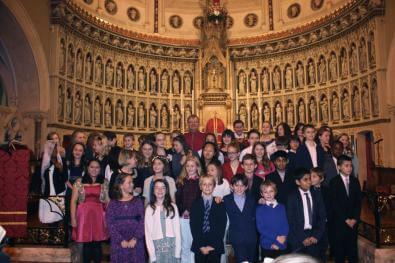 Here are some of the newly-confirmed with Bishop William Kenney after the Mass of Confirmation on Monday. We are particularly grateful to Bishop William for coming, given that he broke his left wrist in the South Sudan a little while back, and this was the first liturgical action he has performed since then. Fortunately a bishop confirms with his right arm!